I have 6 ducks and a drake. 3 of the ducks are completely a khaki colour and slightly smaller than the others. The other 3 ducks have some other colours on their wing, a dark blueand white colour and also have yellow stripes near their eyes as if they are wearing a zorro mask. They are also considerably bigger and as big as Sir Francis Drake! 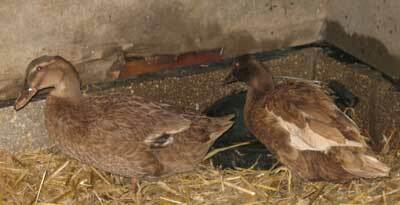 I just assumed they were all pure khaki campbells as I had bought khaki campbell eggs but I think three have mallard/aylesbury in them. Interestingly the 3 pure khakis seem to stick together I don’t know if this is because they are smaller and are bothered more by the drake and the larger ladies hang about with the drake more. Here is a photo of one of the ducks I think is a khaki cross and one of the pure khaki campbells. Let me know what your thought are on the colouring of my khaki campbells.